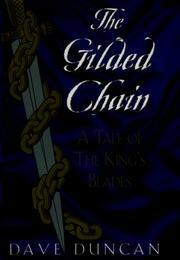 First installment of a new fantasy series from Duncan (Future Indefinite, 1997, etc.) set in the land of Chivial, where King Ambrose IV is defended by his many Blades, expert swordsmen bound in a brutal magic ritual to defend him to the death. Once a wild lad, young Durendal survives the many hardships of training, only to be bound not to the king, but to the odious, smirking Marquis of Nutting. The reason for this, so the dejected Durendal learns: the king distrusts the marquis. The marquis soon plots against the king and is accidentally killed by Durendal; the shock of this deed drives Durendal crazy. The king himself arrives to order another, extremely hazardous, ritual to undo the binding; and so Durendal becomes Ambrose’s man and is confirmed as the kingdom’s finest swordsman. Later, the king dispatches Durendal to the remote land of Samarinda.With his own bound Blade, Wolfbiter, and inquisitor Kromman, the king’s spy, Durendal discovers the truth: that the monks of Samarinda are indeed rich in gold, and immortal—-and they—re cannibals, too. The Blade they sought to rescue has been corrupted by, and become a part of, the brotherhood. Kromman betrays Durendal and flees. Both eventually return to Chivial, where the king makes Durendal his chancellor—-so he’s unable to take his revenge on Kromman.The years pass; Ambrose falls ill and is tempted by Kromman’s offer of immortality. And so Durendal sacrifices himself to defend the kingdom against its now revoltingly undead monarch and the unspeakable Kromman. A yarn that has the characteristic Duncan style—-good characters; fine plotting; a lean, swift, supple narrative—-yet lacks that delightfully quirky touch that inspires his best work. Something of a disappointment, then, if only because of the author’s own lofty standards.